You are here: Home » General Plan update coming, but will it hit right notes? Since a 2008 settlement with the state attorney general’s office, Stockton has been under a legal mandate to update its General Plan to reduce sprawl and develop the city’s core. So far, that effort has been strangled by bureaucracy or stalled in the name of sorting out the city’s bankruptcy. But according to a pair of city planners, Stockton could have a revised blueprint for growth as early as December 2017. The city will embark on a General Plan update very soon. Community Development Director David Kwong and Planning Manager David Stagnaro, appearing before sustainable growth group Campaign for Common Ground on Sept. 15, said work was beginning this week to find a consultant to carry out the “heavy lifting” of the General Plan update. If all breaks right, Stagnaro said, the City Council could sign a contract with the consultant by Dec. 8, and the process could be completed before the calendar turns to 2018. At least one thing planners need to get a handle on is the capacity for downtown development. The revised General Plan and an attendant Downtown Element and Housing Strategy will call for 4,400 housing units to be built downtown — a major component of the 2008 settlement and a necessity for revitalizing Stockton’s downtown as a lively commercial and cultural center. For that to happen, there must be sufficient water, sewage, and other infrastructure. One complicating factor is the county courthouse project. The new courthouse will consume significant wastewater capacity, and since it appears the old courthouse could remain in operation despite earlier promises it would be razed, that building’s wastewater capacity will not be available to serve other projects. It’s also unknown what capacity exists in some specific corners of the downtown, given the age and condition of some systems. Stagnaro said some downtown areas might not be able to handle the increased load without serious upgrades. This knowledge will be critical to developing what the planners called “infill development opportunity sites,” that will be considered based on complementary nearby land uses, existing nearby investments, and availability of infrastructure. The ultimate reality is that deciding where and how future growth occurs is the lynchpin of the entire exercise. While the update also involves other important issues, the character of the updated General Plan will depend upon where growth will happen, and what kind of growth it will be. 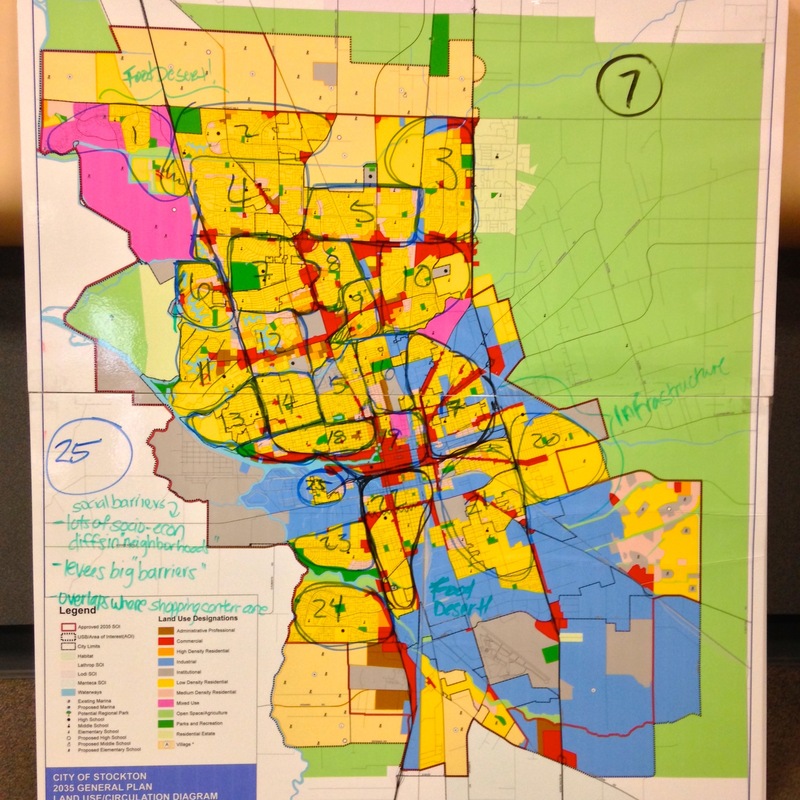 Like it or not, that means seriously discussing placing limits on Stockton’s outward sprawl. A conversation centered on sustainable, sprawl-free development must be a top priority of the revision process, rather than an afterthought that is put off until a de facto decision on growth has already been made. There indeed remain many unknowns regarding the General Plan revision. But one certainty is that the 2008 settlement and the city’s slog through bankruptcy confirm the urgent need to limit greenfield development in favor of prioritized infill development and affordable housing. These concepts must be included in the revised General Plan, and should be embraced by the update process as soon as possible. Good to see the process crawl forward, with a sensible focus on downtown. As your colleague David Garcia may recall, I think some effort and funds were wasted on a Climate Action Plan, when really we needed to focus on downtown and midtown infill, and any climate issues could be addressed by planting more trees and improving public transit. The energy issues are already addressed statewide by the CEC and similar efficiency rules. I do wish “advocates” would embrace a program to convince our large downtown employers (City of Stockton, County of San Joaquin, in the past the Federal Government, SUSD), to provide incentives for their employees to live as well as work downtown, and disincentives to live elsewhere. You need middle income, savvy folks residing downtown. Modest incentives, at a fraction of the cost of grand schemes that will never work, should be tried. There are all sorts of cavils that can be raised, but Jon, they are indeed cavils. If you want a vibrant city core, you need residents to dwell in the heart of the City. Advocates should lobby employers to adopt meaningful programs to encourage residence in downtown and midtown.